This tour gives you the complete rainforest experience while spending 3 nights inside the Reserved Zone of Manu and 2 full days inside the Park! You will travel through the cloud forest over the famous Manu Road and explore the lowland forest’s oxbow lakes and salt licks. 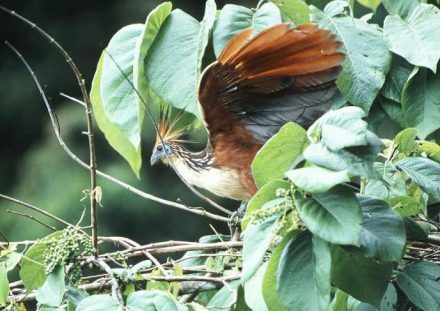 We travel through the lush cloud forest with its abundant bird life and enjoy great scenery while we go downriver to the lowland, exploring the Manu River inside the Reserved Zone of the Manu National Park. 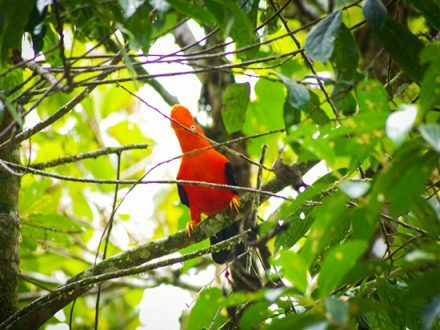 Here, we visit the Salvador and Otorongo oxbow lakes and have one extra day to hike through the primary forest. We also go to the big macaw lick and the mammal salt lick. Returning, we pass Colorado through the Transoceanic Road. After an early breakfast we continue our adventure with our minibus: we will pass the village of Pilcopata and cross the river of the same name to get to the small port of Atalaya (600 meters). On the way, we will stop for some short walks to observe birds and to visit a local orchid garden. We can also go on short walks along the road to look out for monkeys and birds. 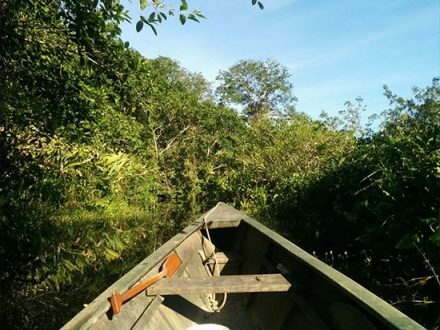 In Atalaya, we embark and start our 4 to 5 hours-journey in a 15-meter motorized canoe down the Alto Madre de Dios River. 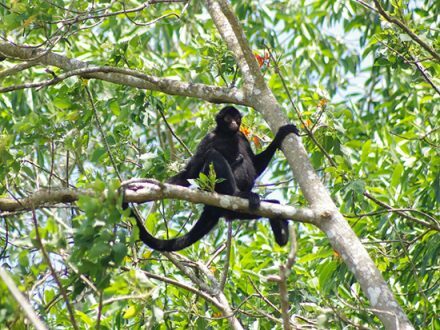 Today we enjoy the changing landscape and have the opportunity to see a lot of wildlife along the rocky banks of the river, such as Fasciated Tiger Herons, Purplish Jays, Skimmers, Vultures, caimans and some of the 13 monkey species that live in Manu. In the afternoon we reach the Pantiacolla Lodge or the Hummingbird Lodge, where we spend the night. In the evening, we do a night walk to see many insects, frogs and snakes. Today we continue our boat ride downriver towards the lowland forest, travelling into the Reserved Zone of Manu. We reach the mouth of the Manu River and after a short stop at the Limonal Guard Station where our permit is checked, we travel upriver into the Manu National Park. During this boat trip, the scenery and wildlife viewing along the banks of the Manu River are fabulous! White Caimans (Caiman crocodylus) sunning on the beaches, turtles, capybara and plenty of colourful birds may bee seen. And there is always the possibility of seeing greater animals such as Tapir and Jaguar. In the afternoon, we arrive at the Albergue Casa Matsiguenka where we spend three nights in double rooms. The lodge is built in a typical matsiguenkan style. Optional, we will do a night walk. At dawn, we take the boat to travel further upriver to the remote Pakitza Biological Station. Dawn and dusk are ideal preconditions to see wildlife on the river banks, so this is a good chance to spot a jaguar! We will have breakfast at Pakitzaand afterwards head off to explore some of the trails to look out for more wildlife. In the afternoon, we return to Casa Matsiguenka. 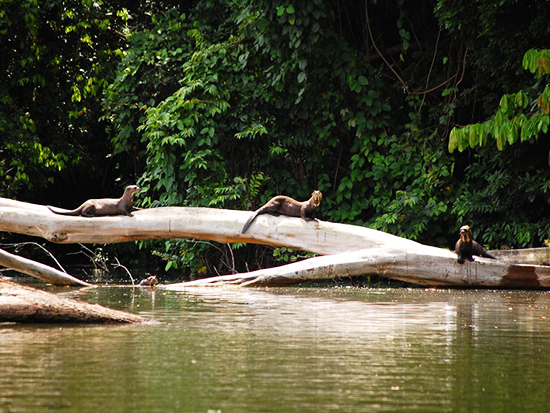 To observe giant otters, we can visit the Salvador Pond again or explore some of the nearby trails. We spend our night at Casa Matsiguenka and have an optional night walk. We start at first light and travel 6 hours down the Manu River. Capybaras, caimans, birds and with luck one of the big cats may be seen. We make a short stop in Boca Manu village, or Fitzcarrald, and then continue on the wider Madre de Dios River. Further downriver we reach the Maquisapayoj Reserve (Place of the Black Spider Monkey; double rooms with private bathroom). This area is home to numerous monkey species, including the rare Tamarin Monkey and Monk Saki Monkey. After a short rest, we go for a walk to the mammal salt lick where we look out for monkeys, deer and other animals who visit the lick. After returning to the lodge, we explore the forest during a night walk to see insects, frogs and snakes. Optional, we spend another night on the platform at the salt lick. At dawn, we take the boat to the big macaw clay lick in Blanquillo. From a platform, we will have an excellent view to observe flocks of colourful macaws (Ara chloroptera, – macao), parrots and parakeets congregating to eat the clay which is essential for their digestion. Looking through our spotting scope, we can observe every detail of the birds! We will have breakfast at the blind and then, after the spectacle, return to the Maquisapayoj Lodge. After a short break, we will walk for about 1 ½ hours into primary rainforest to the Mammal Salt Lick. Here, we spend the night on an elevated platform (with mats and mosquito nets) to observe tapirs or other mammals during the night. Your guide will help you to spot the tapirs with a light. If you prefer, you have the opportunity to sleep in double rooms at the lodge as well. 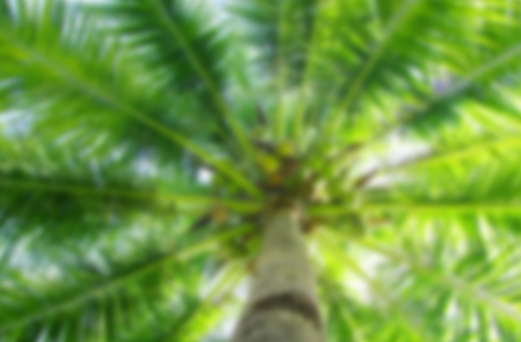 Alcoholic drinks, personal expenses, etc. * includes Park entrance fee!